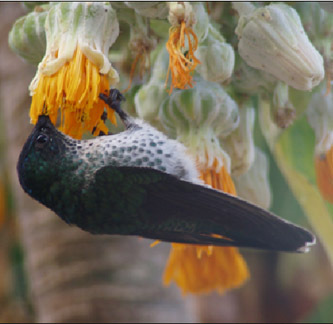 The hummingbird community of Robinson Crusoe includes two species: the endemic Juan Fernández firecrown (Sephanoides fernandensis) and the Chilean native green-backed firecrown (Sephanoides sephaniodes). These hummingbird species are the only two known to reside on oceanic islands (1). The endemic Juan Fernández firecrown is found only on Isla Robinson Crusoe and is seasonally a highly visible species in the town of San Juan Bautista. However, the species has a restricted breeding range, apparently depending exclusively on intact native forest for breeding. Native forest on the island declined historically in both its extent and its abundance due to harvesting, clearing and burning. Although fully protected now, the remnant native forest is currently threatened by invasive plant species such as maqui (Aristotelia chilensis) and elm-leaf blackberry (Rubus ulmifolius). Given their dependence on intact forest for breeding, the alteration of forest structure and composition by invasive species is a primary conservation concern for the species. Although the population was recently thought to be as low as 400 individuals, based on our recent surveys it now appears that the population numbers approximately 2,000-3,000 individuals. However, the impacts of invasive species and predation by non-native mammals remain major threats to the long-term survival of the Juan Fernández firecrown. The Juan Fernández firecrown may also serve as an indicator species - research efforts are aimed at understanding how changes in habitat (replacement of important native flora used for foraging and nesting by introduced flora) and local fauna (introduced predators, possible competitors) affect the endemic hummingbird and signal decay of the local forest ecosystem. In addition, Federico Johow (Aves Chile, CODEFF) and an island resident, Sara de Rodt, have been monitoring firecrown nests during the breeding season. We have also supported a community cat spay/neuter program initiated in 2002. We are coordinating efforts to protect prime firecrown breeding habitat on Robinson Crusoe. See section below on Firecrown habitat restoration. (1) Colwell, R.K. 1989. Ibis 131:548-566. 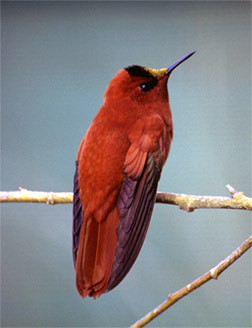 The Juan Fernández firecrown requires intact native forest in order to breed. Due to the massive loss of forest historically due to harvesting, clearing and burning, breeding habitat for the firecrown has been correspondingly reduced. Although all native forest is now fully protected, it remains threatened by non-native plant species which are successfully invading and altering the structure and composition of the forests. Given these threats, conserving existing native forest is an extremely high priority, not only for the firecrown but also for the endemic plant species dependent on native forest structure. Since 2004 we have been conducting invasive plant control in a sector of forest, Plazoleta del Yunque, that is critical breeding habitat for the Juan Fernández firecrown. The work has focused on removing two aggressively invasive plant species, maqui Aristotelia chilensis and elm-leaf blackberry Rubus ulmifolius, focusing initially on areas in and around forest clearings. Firecrowns appear to prefer nesting on the edge of forest clearings that are free from invasive species and, thus, maintaining these areas free of maqui and blackberry is a high priority. 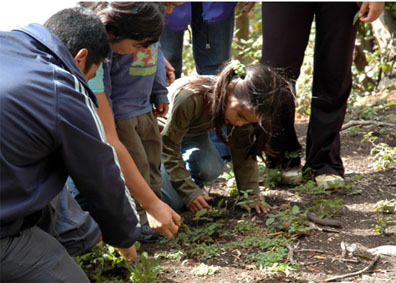 As on many islands around the world, the biodiversity of the Juan Fernández Archipelago, is threatened by invasive plants. Local experts, volunteers, and U.S. researchers are learning from each other the best methods to improve the habitat. Paola, one of the local project coordinators, teaching volunteers about seedling identification. The breeding season is underway, with a record number of active Juan Fernández firecrown nests located in August. Nests have been observed in all stages of development. We are lucky to have an expanded team helping out during the breeding season, including the island coordinators, Christian López and Paola Gonzalez, two island technicians, Fabian Perez and Prisila Chamorro, and two volunteers, Kira Pontius and Deborah Kurtz. In September, veterinarians administered vaccinations to 100 dogs and sterilized 24 cats within the town of San Juan Bautista. This visit was supported by the community and inspired by a study where pet cats were followed to understand the principal predator to the threatened hummingbird. In addition, the vaccinations will help reduce the risk of infecting native fur seals with distemper. Firecrowns should have a great year in 2008. Thanks to donations from the American Bird Conservancy and the Hummingbird Society, two local research technicians Paola Gonzalez de Rodt and Christian López Chamorro will be working year-round on Robinson Crusoe Island. In collaboration with ecologists and national park staff, they will focus on the timing of firecrown breeding, invasive plant control to improve nesting success, and other experiments to restore the native forest. 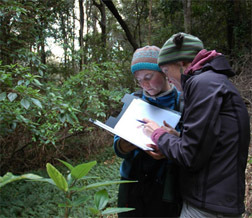 The effectiveness of conservation is greatly improved with year-round attention. Erin Hagen and Coral Wolf made a new discovery this season. They documented that females can lay a second clutch of eggs in the same season. It is important for habitat improvement efforts to know that the birds can have active nests into late November. Kelly Jones, and project veterans Paola Gonzalez de Rodt, Erin Hagen, Christian Lopez Chamorro, Sara de Rodt Araya, and Coral Wolf. Christian and Paola use a long pole with a mirror on the end to check the contents of a Firecrown nest. Preliminary results of invasive plant species removal from the Plazoleta study area suggest that firecrowns quickly respond to, and utilize, areas cleared of invasive plants. Thus, with funding from the Americn Bird Conservancy, Conservation International and The Hummingbird Society, efforts are continuing to control maqui and blackberry in this area to maintain and augment critical breeding habitat. In addition, regular population censuses are in progress by Dr. Maria Victoria Lopez-Calleja of the Universidad Catolica, in collaboration with Dr. Cristián Estades of Universidad de Chile.